Prepare an 8 inch square baking dish lining it with 2 sheets of aluminum foil as shown in the pictures and spray with vegetable spay. 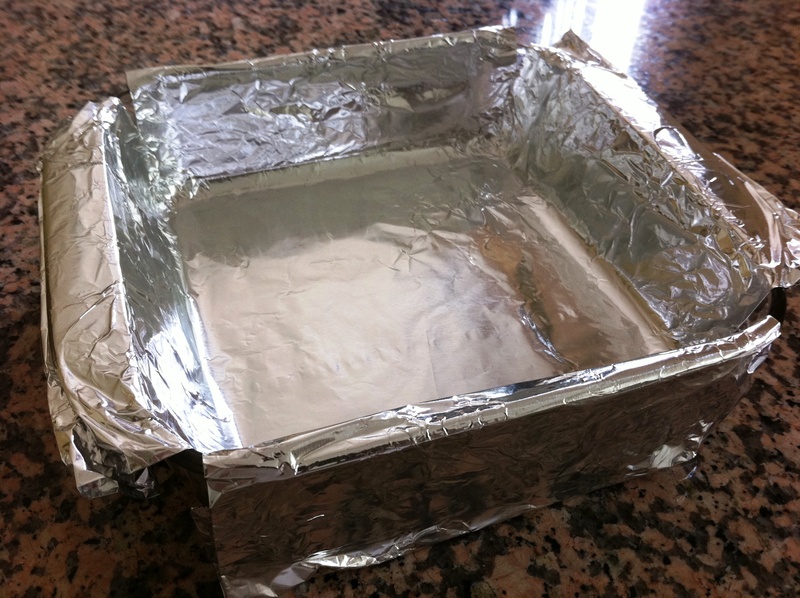 Make sure the foil is snug against the baking pan and the wrinkles are smoothed completely and set aside. 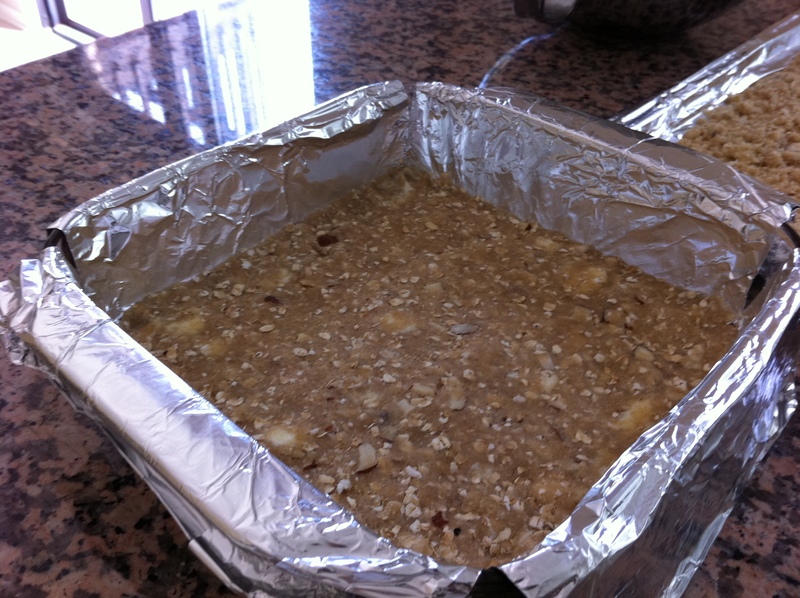 Don’t cut the excess foil; you will need it to remove the dessert from the pan later. Additionally, line a baking sheet with foil for easy clean up. 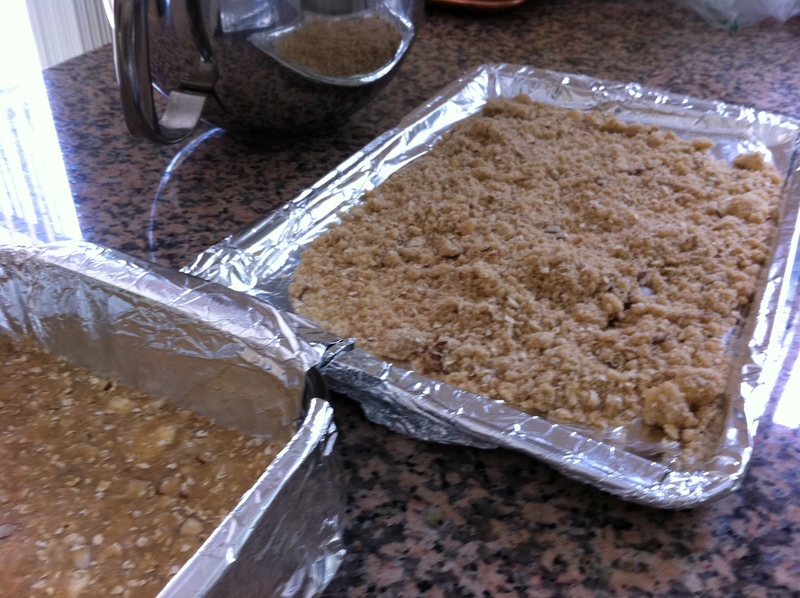 Next prepare the crust and the topping at the same time by combining the flour, granulated and brown sugars, salt, oatmeal, sliced almonds and cold diced butter in the bowl of the stand mixer fitted with the paddle attachment, Combine just until the mixture is mixed but crumbly. Take some of the mixture and press it into the 8×8 square pan as firm as possible so the crust is packed and covers the bottom completely and is between ¼ but no more than ½ inch high in thickness. Now take approximately 1 cup the remaining mixture and spread evenly on the sheet pan lined with foil. 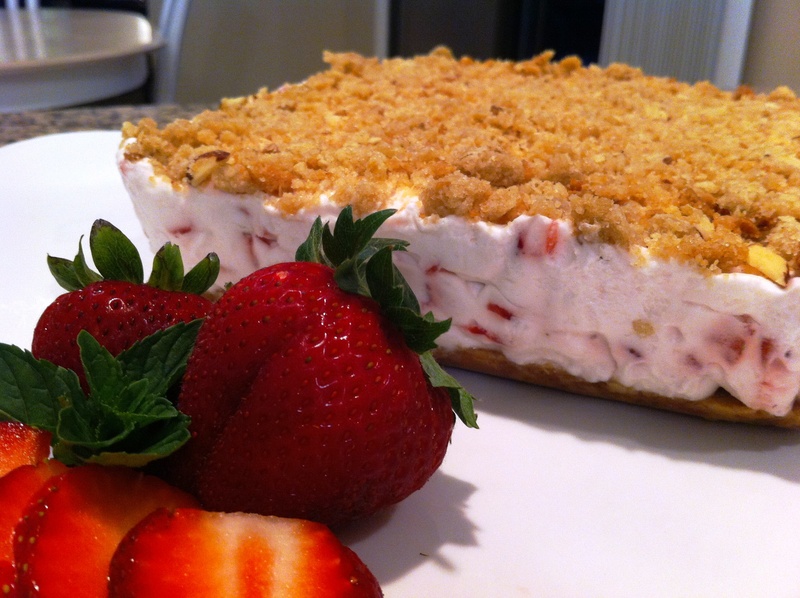 *I freeze the remainder of the mixture for a quick crumb topping to any dessert. Place both the crust and sheet pan with the crust and topping in the oven to bake for 20 minutes. The topping on the sheet pan will need to be stirred occasionally while baking for even browning. Remove the pan with the crust as well as the sheet pan from the oven after about 20 minutes and both are light golden brown and fragrant. Allow both pans to cool to room temperature leaving the crust in the 8×8 dish while the filling is prepared. 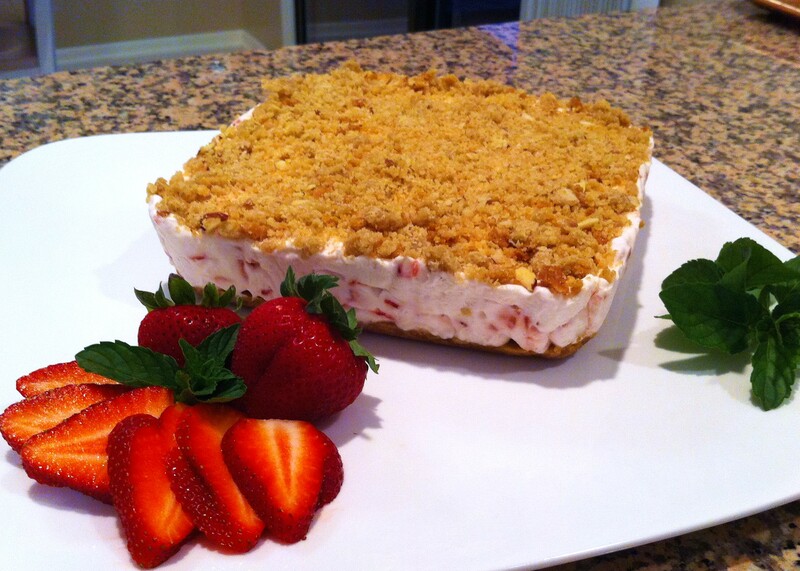 To make the filling, first add the diced strawberries to a large bowl. 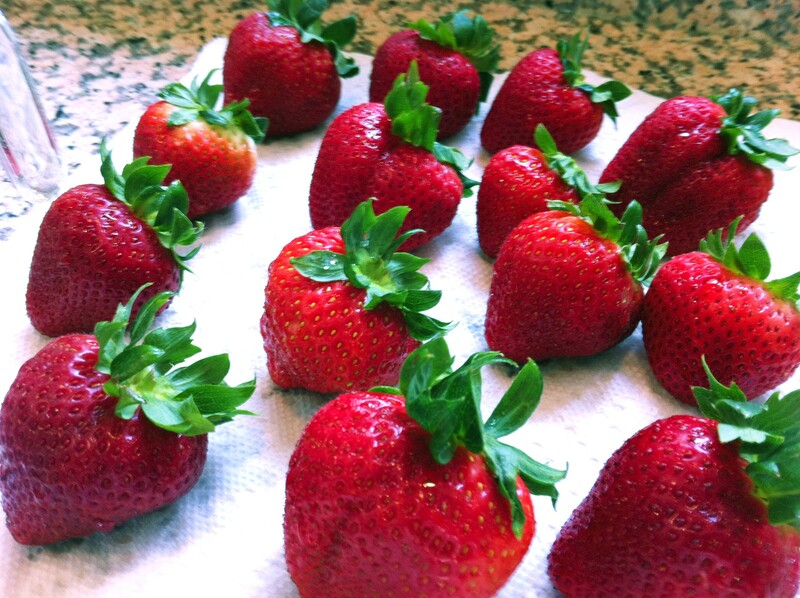 Add 2 tablespoons of fresh lemon juice to the diced strawberries along with 1 Tbs of granulated sugar and mix to combine. Next beat 2 egg whites in a stand mixer using the whisk attachment on medium for 1 minute, after 1 minute add the granulated sugar and continue to whisk until stiff peaks form. 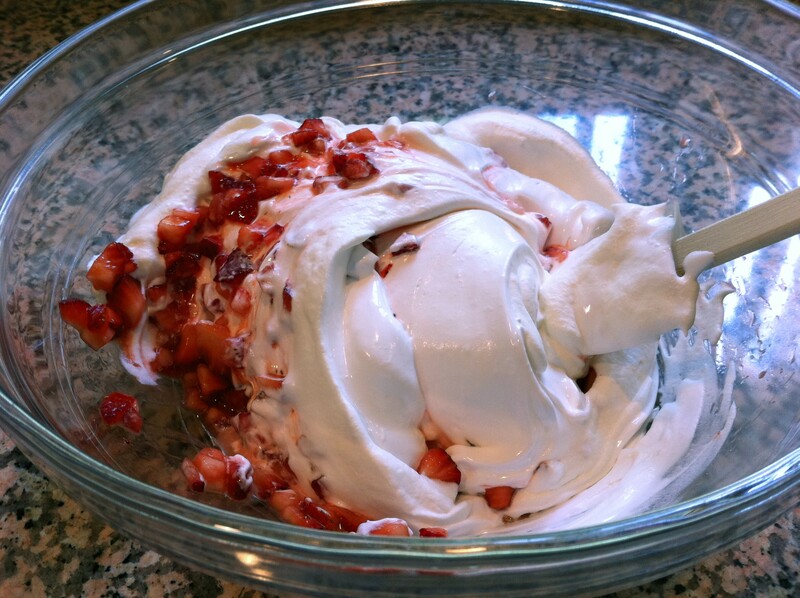 Transfer the mixture gently to the same large bowl with the strawberries and being careful not to deflate the egg whites. Don’t mix the egg whites into the berries at this point. 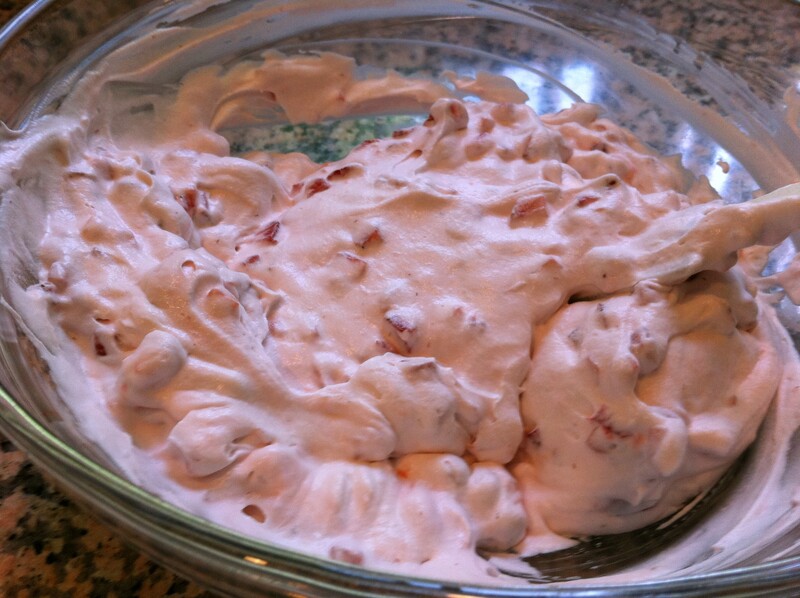 In the same stand mixer bowl whisk the heavy cream until soft peaks form and then transfer the whipped cream to the bowl with the berries and egg white mixture. Using a rubber spatula fold to gently combine and fully incorporated. 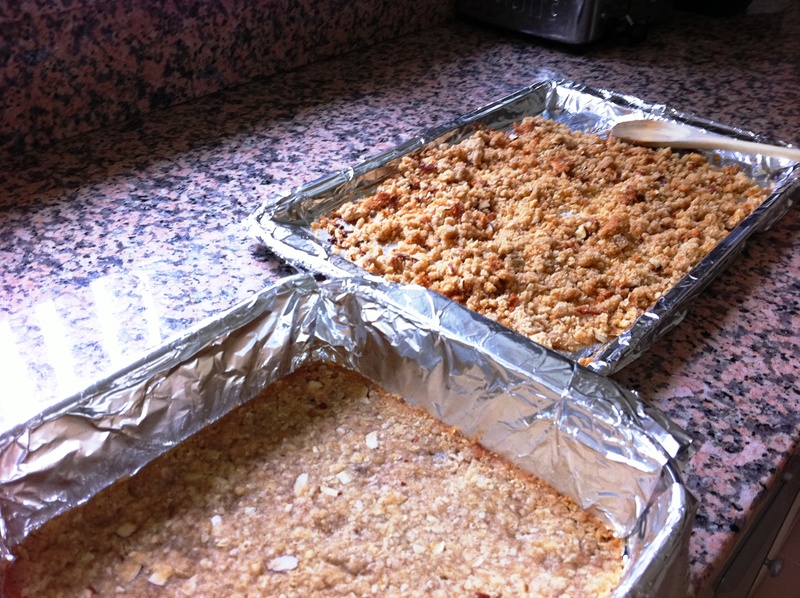 Once the mixture gently combined spread the mixture over the cooled crust and then sprinkle the golden crumble topping that has cooled over the top of the filling evenly. Place the sides of the foil from the crust over the top and then place plastic wrap over the top and place in the freezer for 6 hours or overnight if covered well in plastic wrap. To serve remove from the freezer and holding on to all four pieces of foil remove the uncut bars from the baking dish. Cut the bars into 16 squares on the foil lining over a cutting board and remove any foil if it sticks to the crust. 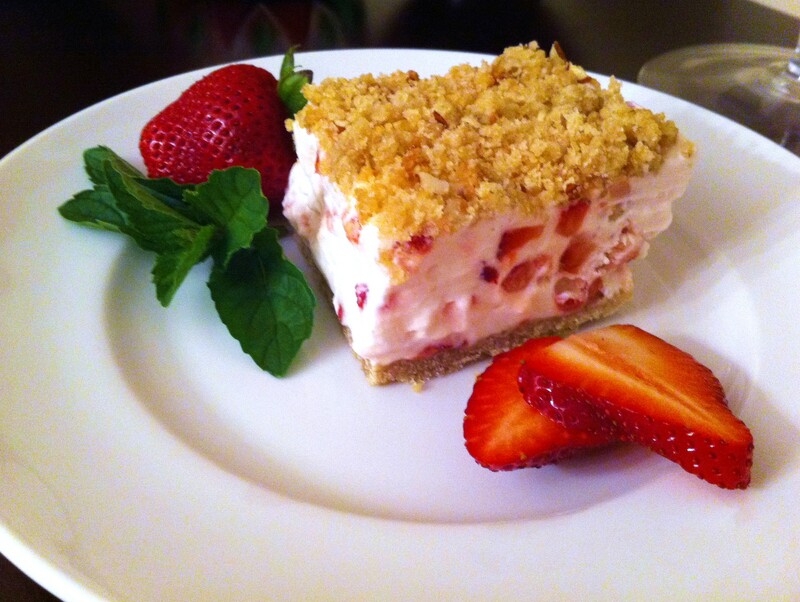 Serve each slice with fresh sliced strawberries and mint.